Lunch is an indirect reference to the contentious lunch counter sit-ins occurring across the nation during the 1960s, but its pale palette and dull figures have none of the heated passion so often associated with them in real life. 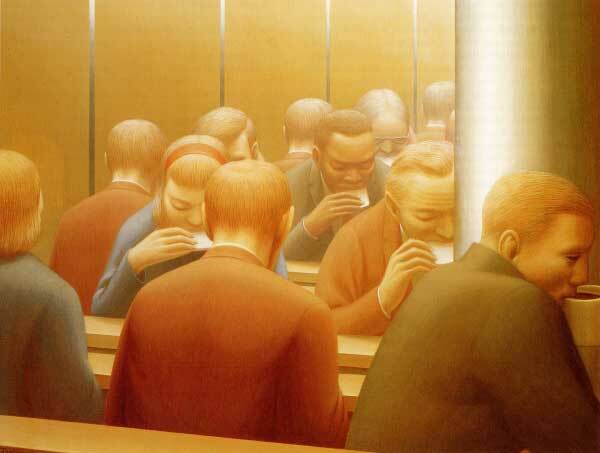 Instead, Tooker’s figures all bear an uncanny resemblance to each other and eat their identical lunches with identical motions. Lunch is an expression of the assimilating effects of modern work, as well as an illustration of the isolation humans can experience, even when in a room full of people. George Tooker, Lunch, 1964. Egg tempera on gessoed panel, 20 x 26 in.